Too often, society’s response to children with special needs is to isolate them from physical and social activities – a reaction that research shows could ultimately hinder healthy social-emotional development. Take running and football – physical activities typically not afforded to young people with complex developmental disabilities, autism, emotional regulation challenges or other mental health issues. At PEP, though, teacher-counselors regularly integrate opportunities for movement and sport that are designed to promote healthy outlets for uncomfortable feelings. “All kids should have opportunities to be a part of a team, to learn to persevere through difficult tasks, to feel joy with others while engaging in a sport, and most importantly, to be filled with pride as they cross a finish line and realize that they accomplished something they didn’t think was possible,” PEP Clinical Services Director Aaron Muttillo said. 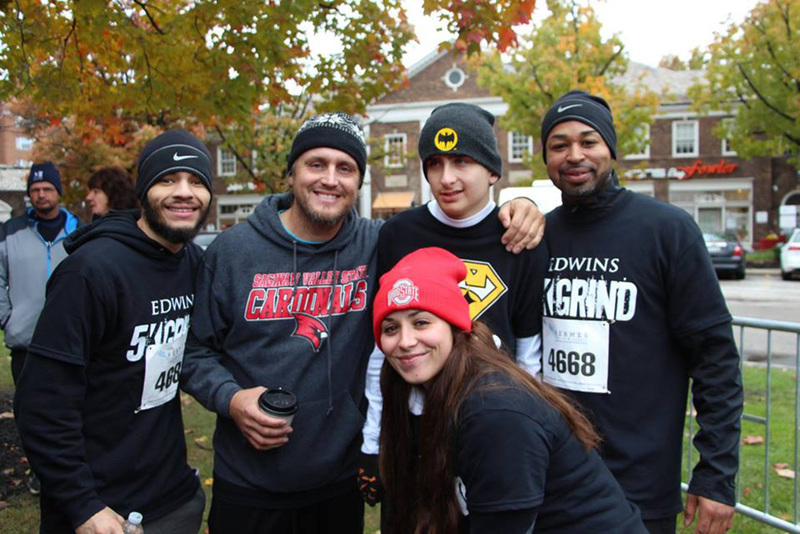 The goal of the PEP Running Club, for example, is for students to experience the rewards of completing a marathon (26.2 miles). The program involves students accumulating 25 miles of movement (running, jogging, walking) over a period of time through scheduled weekly sessions, culminating with a 1.2-mile race to accomplish their marathon goal. In addition to weekly sessions with coaches, the program includes a half-day conditioning clinic and practice race. Team members receive running shoes and a team shirt. Following the completion of the race, there is a team banquet where each student receives a medal. Meet Zachary, a student at PEP Prentiss Autism Center and one of the club’s stars. He has always been a runner – a trait not uncommon in children with autism who often flee when moments overwhelm. PEP teacher-counselors working with Zachary discovered that running, in fact, helped him regulate his emotions and focus. They ultimately channeled his running into a positive and therapeutic activity. Today, Zachary is a runner in the best sense, having completed a handful of 5K races alongside hundreds of others – a task that, in many ways, might have seemed untenable just a few years ago. In addition to the therapeutic benefits, these sorts of physical activities are designed to promote a sense of pride. PEP Prentiss, for instance, recently held its annual Super Bowl – an event that typically took place at the center’s facility in Fairview Park. However, this year Cuyahoga Heights Schools offered the district’s stadium for the event. The district delivered in a big way – with cheerleaders, a band and bleachers packed with Cuyahoga Heights students. Cuyahoga Heights even bused the PEP Prentiss crew to the facility. 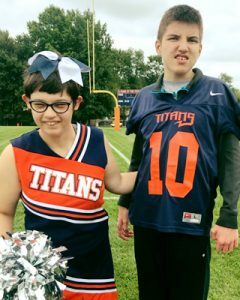 And then there is Kaleigh and Nick – two proud members of the Berea-Midpark Middle School athletics program. Kaleigh, who attends PEP Prentiss, is a member of Berea’s 7th grade cheer squad. Nick, who attended PEP Prentiss for several years before transitioning back to the district, is in his second year as the team trainer for the 7th grade football team. At the last game of the season, Nick even scored a touchdown alongside his teammates – the culmination of two years of hard work. The officials and Berea’s opponents from North Ridgeville were more than willing to help Nick cross the goal line. “It is great for the other kids to be inclusive and learn how to work with people who are a little bit different from them and realize that we’re not really all that different,” David Weiss, an occupational therapist at PEP Prentiss, told Fox 8 this fall.